The final keynote from the i3 conference was from Dorothy Williams (original chair ofthe i3 conference) on An information conundrum. She defined a conundrum as an "intricate and difficult problem". A central problem was "In an information world - a world which already recognises the importance of information - how can we tell the world how important information is?". This tied back to some of the arguments of the first keynote speaker, Olof Sundin. As he said, information has become an everyday part of life, and (quoting Floridi) the "information revolution" affects our understanding of ourselves and how we are connected and part of the world. The word "information" itself has become even more an everyday word, sometimes used to help explain other difficult phenomena (e.g. DNA). In fact the ubiquity of information is one of the challenges of getting our messages across: getting them across in a world that may think it already "knows" and "gets" information. In terms of importance: a lot of money is spent in facilitating access to information via ICT, stories about information security and misinformation get into the headline etc. However, information practitioners and researchers still feel that they have contributions that will make a difference. 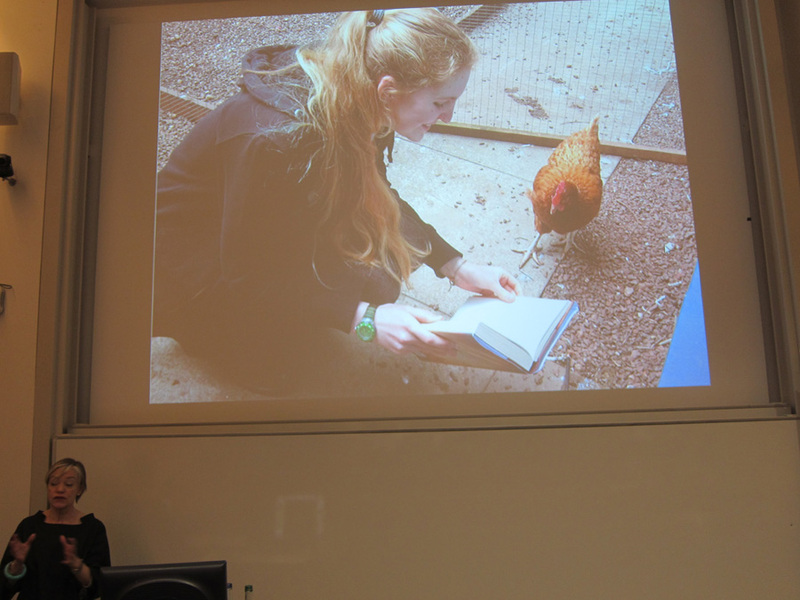 Williams used an anecdote situated in an Edinburgh highschool library that incorporates a courtyard with chickens (pictured above) which hosted the launch of a campaign to save school libraries and librarians. One member of parliament who attended said "his eyes had been opened" in terms of what information literacy and librarians can do. This highlights how people can be unaware of the impact of what we are doing, but may respond very positively and actively once they do. A second example was a research study on energy innovation in meat and dairy industries. Part of the model they developed included whether the companies had data, or information, or knowledge about what was going on in the company so they could MAKE informed decisions about energy decisions. For example, one company did not even know what they spent on energy, another did not know what all the bits of kits were that consuming energy. So information was vital to getting to grips with the business problem. From these various concerns, the i3 conference itself emerged (Williams showed a picture from the first conference, which I was at, only rather younger and slimmer at that point) to encourage research conversations between different related fields and encourage impact and interaction. This moved her on to "Are our own i3 information conversations changing the world?". Williams had analysed past conference contributions in terms of whether they dealt with: information behaviour; information literacy; impact; or agent of change (this last one was just flagged up recently). This was going by how authors self-identified their papers, and with impact the association was sometimes rather loose, rather than central. Thus it was less prominent than Information Behaviour or IL. About half the papers focused on one theme. 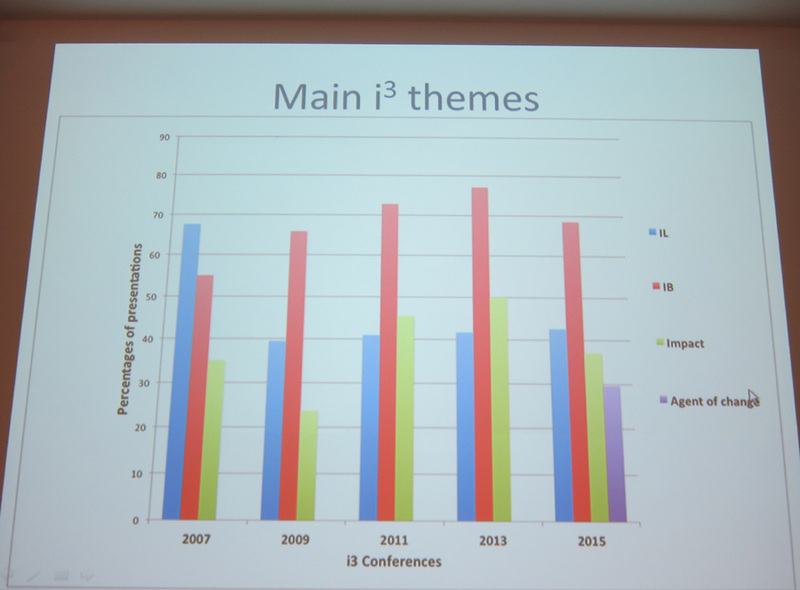 In terms of contexts for research described in the papers at i3: education was by far the most frequent (although the number of papers on this had gone down over the years), followed by the online environment, and then health, workplace, demographics (i.e. focus on a specific age group ort sector), community and social media (with a variety of others covered less often e.g. cultures, government, business, knowledge management). Williams picked out an underlying theme of looking at how we can give more equal or better access to information. Williams then stepped back to what the world has been talking about e.g. austerity, energy and climate change, poverty, privacy and security. She queried how we connected with those big issues, and whether we had a contribution that could demonstrate our value in meeting these big challenges. Williams picked out themes she saw in the i3 conversations over the years since the first conference in 2007. Note that in every conference there have been sessions where questions and concerns were discussed explicitly. There were questions about the scope of the field (e.g. covering the affective domain better), what should be researched and how the fields were related. We have asked (in the conferences) whether we were too risk averse, and whether we needed to tackle more uncomfortable questions. Questions of "how well are we doing ourt research" also emerged from conferences e.g. were the range of methods too narrow, whether more clarity was needed. Then there was "Complexity" - whether we were reflecting the messiness and complexity of information and information problems. There was the difficulty of dealing with complex systems - and also understanding where does the complexity lie. An ongoing challenge was in dealing with this complexity when talking to communities outside the information field. Finally a theme emerged about impact, how to demonstrate the impact of information, to identify the role of information (support or change agent), and the need for more evidence of impact (e.g. in the workplace). Williams noted here that good case studies help demonstrate impact. This was related to "getting the message across", another recurrent challenge discussed at i3 conferences. Questions included the role of jargon and identifying our distinctive perspective. Williams finished by identifying that the clarity of the message needed to be improved: stating more clearly and boldly what the contribution of our research is. She felt despite these reservations we are addressing a wider range of problems and more evidence about impact and value ould help us get our message across. Williams returned to Floridi and suggested that our role in the information revolution could be "to help the world understand itself": to help people understand themselves better, because information is so much part of ourselves and our lives.